Anticipation for the first installment of Peter Jackson's epic adaptation of J.R.R. 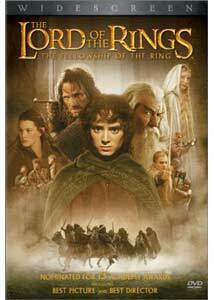 Tolkien's classic fantasy novel is matched only by the anticipation for the DVD releases of the film. In its first incarnation, the DVD of the theatrical release quite nicely lives up to these expectations, with enough hobbit goodness to tide fans over to November and the extended release. Hobbits, for those living in a hole for 65 years, are a mythical race of men standing about 3'6" with large hairy feet. Although often stay-at-home types, a few of them get caught up into unaccountable adventures. The special effects generally come across quite well on the smaller screen. The one exception is a computer-generated sequence of Legolas on the back of a cave troll in the Mines of Moria, which looks terribly fake. But the mix of normal size people playing hobbits and dwarves, alongside human-sized characters, is almost entirely seamless. On occasion, a perceptive viewer might say, "oh, that's using forced perspective," but in general the union of these characters is absolutely seamless. The score, while somewhat derivative (echoes of John Williams' score for Jurassic Park can be heard throughout, and there are obvious imitations of the ubiquitous O Fortuna from Carmina Burana as well), support the picture quite well indeed. The camera tends to be a bit too active, swooping and flashing past in a manner that draws attention to itself. But on the whole, the film is a visual feast full of absolutely wonderful imagery. There are any number of downright thrilling visuals, such as the sight of a backlit Ringwraith waiting impatiently for Frodo, or the Ringwraiths smashing the gates of the village of Bree, or shots of the old fortress at Weathertop in partial sunset, or the 'wraithvision' that provides a perspective as to how Frodo sees the world when he puts on the Ring. Jackson also masterfully uses transitions from scene to scene, compressing the narrative in a manner that keeps connections clear but also manages not to disappoint the Tolkien fanatics. He uses this to good effect as well in providing slightly deceptive connections that heighten the suspense and in many ways make the story stronger than what Tolkien wrote—and to actually improve upon one of the great books of the 20th century is by itself no mean feat. Also read dOc's review of the Extended Edition. Image Transfer Review: The anamorphic widescreen picture is quite beautiful, with tons of detail and textures visible. Color is excellent as well, and the source print is quite flawless, with no damage visible whatsoever. The one significant quibble I have is that the transfer in the Moria segments seems a bit too dark. It's lacking much of the detail that I recall from the theater, and in fact more is visible in the same sequences contained in the trailers. Some minor edge enhancement ringing is readily visible on horizontal surfaces, most notably the horizon and the brim of Gandalf's hat, but it's not terrible. More distracting is compression artifacting on the subtitles during Elven speech; this renders them rather difficult to read. A pan & scan version of the film is being released, but it was not reviewed. Since this film makes enormous use of the entire screen, both in the outdoors and in conversation sequences, I cannot recommend that version, which would lose nearly half the picture. Audio Transfer Review: This disc is LOUD. Even at 1/3 of reference, the Mines of Moria segment literally has my house shaking. As an experiment, I watched the opening battle sequence at full reference levels and found a pretty constant sound level of 105-108 dB, which is enough to cause significant hearing loss pretty quickly. Directionality on the DD EX track is excellent and seamless, and there is huge amount of very low bass, most notably when the Ring bounces on the ground. The snowstorm sequence on Caradhras is lifelike, as is the sound of the Fellowship boating down the River Anduin. Other than the extreme volume levels, there is nothing to complain about here at all. Dialogue is quite clear and the music score sounds full and uncompressed. Extras Review: The feature is well supplemented for a "barebones" version. A second disc is full of promo pieces from the release of the film, including three documentaries that were for bookstores, and the specials that aired on Fox and the Sci-Fi Channel. Since these were produced by the same parties, they tend to overlap significantly. Indeed, between them and the 15 featurettes that appeared on www.lordoftherings.net you will often hear the same soundbites two or three times; one comment by Jackson about Hobbiton being planted a year in advance appears in all four places, making for monotony. However, they all contain somewhat different behind-the-scenes footage and have their merits. Three trailers, including the two teasers are presented in anamorphic widescreen. Six TV spots, including promos after the award nominations came out, are included. A pleasant enough Enya music video for her Oscar�-nominated song May it Be is presented here, as is a preview of the forthcoming video game version of the second film. But what fans are particularly excited about are two previews: the first, running about three minutes, gives tantalizing glimpses of the footage to be added to the extended edition in November. The second provides a peek at the second film, including behind-the-scenes looks at the computer animation that brings the creature Gollum to life. These are both intriguing and appetizing; the viewer definitely wants more. It will be a long wait until November for the extended edition and December for the next installment. The first installment of Peter Jackson's epic hits DVD with a bang, in a gorgeous transfer with a soundtrack that will shake your foundations, and a disc full of extras. Not bad for a DVD that isn't even a Special Edition. Fans of the movie will want this, since it will be the only release of the theatrical version, as well as the November 2002 release of the extended four-disc edition.